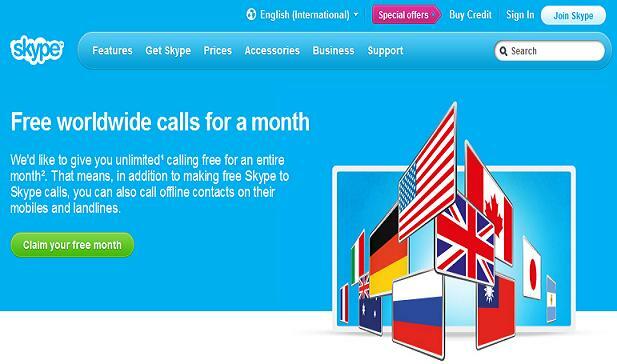 October 2012 | Free Pc to Phone Calls, Free Voip Calls to India International ! Online shopping has become so much common these days. Be it electronics, clothes, footwear, kitchen items or household stuff, people prefer buying these online instead of going to the market and purchasing the stuff. With so much demand, so many different online shopping portals have come up. We have Jabong, Snapdeal, Yebhi, Tradus, Zovi, Foodpanda, Bestylish, the list is pretty long. The best part is that with some voucher codes you will be able to get huge discounts and buy stuff at very cheap prices. Finding these coupon codes can prove to be a difficult task. We recently came across many such coupon codes (which are all working as of now and we have checked them) and decided to share them with you all. Please note that this post is for Indian readers only and some of these codes are of one time use, so use them as soon as you can (before anyone else use it)..
Rs.100 off on purchase of Rs.499 and above. Rs.200 off on purchase of Rs.499 and above. Valid on clothing, accessories, footwear and watches. Rs.250 off on purchase of Rs.1250 and above. Rs.200 off on purchase of Rs.600 and above. 20% off on purchase of Rs.1499 and above. Valid on all products-fresh and sale. Rs.200 Off on Clothing Section. Its time for another voip provider by Dellmont sarl (the very old betamax voip provider), which is quite famous for offering very cheap calling rates. Many people have successfully used betamax, however many other complained about betamax increasing the rates without notice. If you remember Rynga, ActionVoip, WellCallDirect all these are services by betamax. Things may have changed in terms of their service and now we have a new service by dellmont sarl, named VoipR. Lets just hope voipR will hold onto its calling rates and provide a good service. Using voipR is pretty simple and straight forward. You just need to download the voipR application on your smartphone, register with them, buy some voipR points and start making calls. Calling rates are also very competitive. 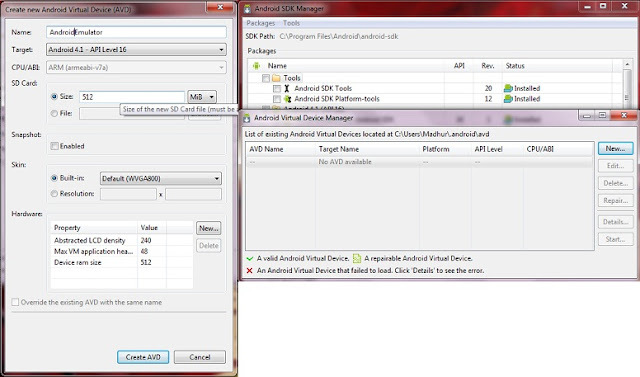 But one thing to be noted is that the application is possible only for Android or iPhone. Also make sure to check with their customer support, as betamax has very bad reputation for its customer support. 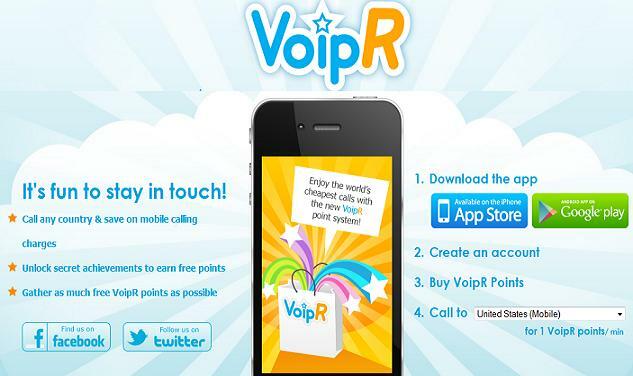 If you have an iPhone or android mobile, then voipR can prove to be a good choice for you. The call rates to India comes at about 2 cents per min (which is not the best rate but very competitive). No we are not talking about Google Voice, instead we are referring to the old gmail chat feature. 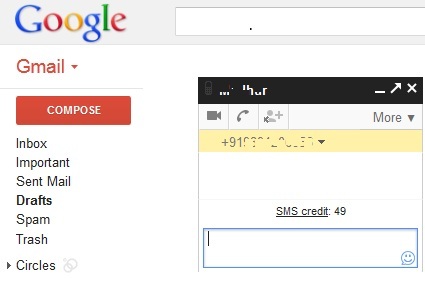 I am not sure that many of you are aware that you can send sms from gmail chat window itself to mobile phones. This feature by Google Chat was earlier restricted to only USA but now the support has been extended. 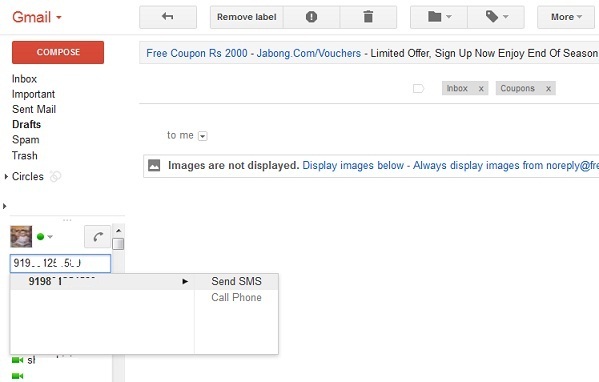 And now you can use Gmail chat window to send free text message to just any phone in India. You can use this to send sms to your contacts mobile phones using Gmail chat. If you want to send sms to a new number (Who is not in your contact list), then simply add it as a contact. Anways we will show the steps with some images. The SMS service is not only available in India and but 51 other countries in Asia, Africa and North America. The best part is that it works for all mobile operators in the country. As mobile companies charge a lot for sms, so using your computer to send text messages highly popular, as it is quite easy to use plus its free. We have also been fan of such a great feature and many a times posted some really good websites offering this feature. If you missed out earlier, then just check our earlier post on list of website offering free text message to mobiles. 1. Sign in to your chat window. 2. 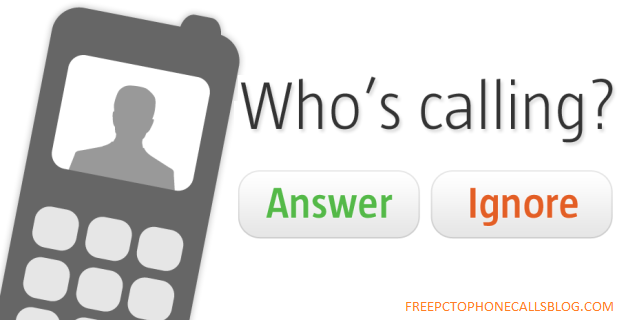 In the "search chat or SMS" bar, just enter the phone number as shown in the image below. 4. If the number is in your contact, then it will show the contact else it will ask you to add it as a contact. 5. It will then open up a small chat window. Just type your message and hit send. 6. You will be charged with 1 sms credit for each message. Google initially provides free SMS credit of 50 messages for each user. For every message sent, users' credit would decrease by one. However, this credit would increase by five every time a user responds to the text message by sending a return message. In case, the SMS credit limit slashes down to zero, one credit would increase automatically after 24 hours. Google said users can also 'buy' SMS credit in case of shortage by sending a text message to their own phone and then by replying to that message. We have tried it and it actually works and it works just great. Sms reaches to the destination within few seconds, its pretty fast. Lets see when Google Starts offering free calls to Indian Mobiles as well. This free sms feature will work from Google Chat application for Android other devices where Gchat works. 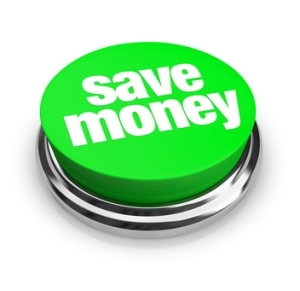 If you have an smartphone then you can use these free sms and save on mobile operator bill. Please try this feature and let us know your feedback. If you have any smartphone be it iPhone, Android, Blackberry, Windows or Nokia Mobile, then you must be using Whatsapp on it. Its such a great application and has helped me save so much money on my phone bills (my text messages via mobile operator has almost reduced by 95%). Chatting with friends, sending jokes, or sharing pictures and videos, Whatsapp is so much fun. I particularly like the group chat feature and message broadcast. Another good thing about whatsapp is that chat history remains as it is. I can see my previous messages as well. But what if you accidentally delete the chat history (what we call the whatsapp history) and it just disappears. That will be quite annoying, its like all my messages got deleted (I can't afford that). There has to be some way in order to get back those messages. The question is how can I backup/restore my whatsapp history. 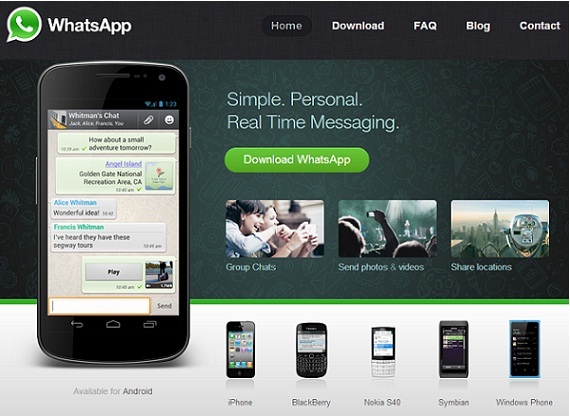 If you are new to whatsapp, then its high time that you check out Whatsapp Messenger application for your smartphone. Its a must have app for every mobile. 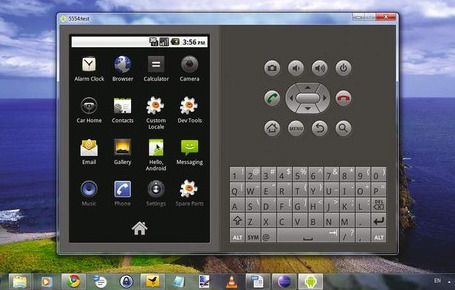 And if you don't have any smartphone, then you should start using this cool application on your computer. But before we go into details of restoring the chat history. Lets first see, how it can get deleted. 1. Selectively deleting a particular message of a particular chat. Go to the particular chat (where you want to delete a message). Tap and hold the message (one message), and delete will appear in popup. Select that. 2. Delete a particular chat (with one friend). Go to the conversation (chat with that friend). Click more icon, and select "clear messages". 3. Delete Whatsapp (all chats with all friends). Click more (adjacent to settings), and select "clear all messages". It will delete everything, every whatsapp chat. Aahh...and now how to get this all back. WhatsApp automatically makes backups every 24 hours and stores them on the microSD memory card of your Android phone. To restore the most recent back up, you will need to delete and reinstall WhatsApp. If you need to restore older messages, check out "Restoring older (less recent) backups". During the installation process, you will be prompted to restore your message history. Choose yes to restore your missing chats. Now those chats that you once thought lost should be in your WhatsApp chats menu. If you do not want to lose your current history (newest messages), create a manual backup. This manual backup file will be saved as "msgstore.db.crypt" in your /sdcard/WhatsApp/Databases folder. Save this file as "msgstore.db.crypt.current" so you do not get it confused with other backup files during the restoration process. - Go to Settings Scroll to the bottom and select "Email Chat History"
- From the "Chat History" screen, select the conversation you would like to save. - Select if you want to "Attach Media" or email the conversation "Without Media". - Enter your email address and hit send! - It automatically does not get stored. First of all you have to activate message history archiving in the settings menu. You can turn message history off or save it to the media card. And then history can be easily browsed in the chat window by scrolling to the top and click "View earlier messages". Please note that this only works if you have media card installed on your phone. The best way to keep your chat history safe is to just select the email the conversation to yourself. This works on almost all mobiles (where whatsapp work) and will work for Nokia Mobiles as well.